OS X Mavericks has been a kind of an incredible update [Read: Some of the OS X Mavericks Features – Making Mac Users Happier?]. It has went well with many, however, there are occasional errors that have affected many a number of Mac users. As previously written about one such issue, disabling App Nap for specific applications, this post will help you resolve issues with Quick Look. In the recent OS X Mavericks update, when you display the pictures in Quick Look preview, they are loading rather sluggishly. This issue has been reported by many Mac users regardless of any specific machine. In fact, even those who are using the ones out this year are also suffering from this problem. This issue is not the only one with Mavericks. This OS X update seems generally to be somewhat slower in speed. Open Applications and select the application Preview. Once on the Preview application, right-click and select Get Info. Now enable/check the Open in Low Resolution. That’s it! 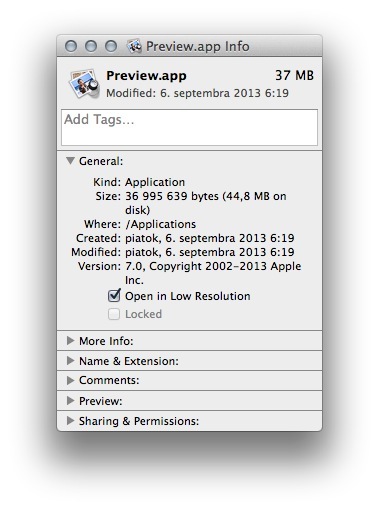 Preview should now run as fast as in any of the previous versions of OS X.